Acquired: Signed on Dec 7, 2018. 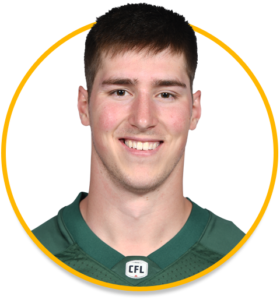 2018: Selected in the fourth round (32nd overall) of the 2018 CFL Draft.Green made his CFL debut in Week Five and recorded seven special teams tackles in eight games this season. Green finished the season on the club’s practice roster. College: Green attended Concordia from 2016 to 2017 and appeared in 12 games. He recorded six carries for 11 yards and one touchdown as well as one reception for five yards.